You'll be £12.99 closer to your next £10.00 credit when you purchase Tracing Your Ancestors from 1066 to 1837. What's this? He starts by describing the administrative, religious and social structures in the medieval and early modern period and shows how these relate to the family historian. Then in a sequence of accessible chapters he describes the variety of sources the researcher can turn to. Church and parish records, the records of the professions and the courts, manorial and property records, tax records, early censuses, lists of loyalty, militia lists, charity records – all these can be consulted. He even includes a short guide to the best methods of reading medieval and early modern script. Jonathan Oates's handbook is an essential introduction for anyone who is keen to take their family history research back into the more distant past. A useful brief introduction to the sources family historians need to consult. Recommended to anyone setting out on the research path, and provides plenty of material for the researcher to get their teeth in to. Dr Jonathan Oates, Ealing Borough Archivist and Local History Librarian, acknowledges how difficult it can be for a family historian to research before 1837. Here, he guides you in a way that is clear, helpful, and honest. After a run-through of the times from Domesday to Victoria, he sorts categories of documentary records into chapters - those created by the state, the church, professionals, by the courts, by taxation; he covers land and property - deeds and leases - and an intriguing 'miscellaneous' (naturalization to coroners, tontines, heraldry and more). He encourages you to delve into manorial records, which can reveal much about the life of everyday folk - the villeins and the freemen. Each chapter is supported with examples and pleasant monochrome illustrations. In an appendix on palaeography and Latin for family historians, he suggests a sensible and practical way of working if you are trying to decipher old handwriting or Latin. Finally, a good contents list and an Index make it easy to find your way round, and there is a manageable bibliography for further reading. Dr Oates encourages you to visit the places where records are held and tells you about everything - what to find where and to how to get a reader's ticket. There are contact details for the major repositories and advice about how to research. And, of course, there is also a list of the websites that have partnered with record-holders to give online access to digitised material. Published by Pen & Sword in their Family History series, the book is nicely produced but, alas, includes the occasional proofreading slip. However, Dr Oates certainly achieves his stated aim of helping you push back the chronological borders of your knowledge. Whether you are researching your own family or undertaking a one-name or one-place study, this book should be essential reading. Most books focus on the easier Victorian era – here Jonathan Oates guides researchers on pushing back through the centuries. The examples he uses encourage new readers to explore further into the past than many might have thought possible. He includes some essential information about the whereabouts of important depositories, of which there are a thousand spread over the country, an the final chapter gives information about the record offices and libraries he has mentioned. Finally there is some advice about reading old and difficult handwriting, a list of published official documents, and a useful index. This book very clearly details all the potential areas of research which the family historian can consider when tracing ancestry back from 1937. Also described are places to visit – the record offices and libraries, as well as museums and archives. The book also includes advice on reading old handwriting and translating Latin. Once the family researcher has experienced this book, the concerns and difficulties about how to progress further back with ancestry, are likely to be replaced by a felling of excitement and a positive relishing of the challenge in seeking family members in the annals of the past. 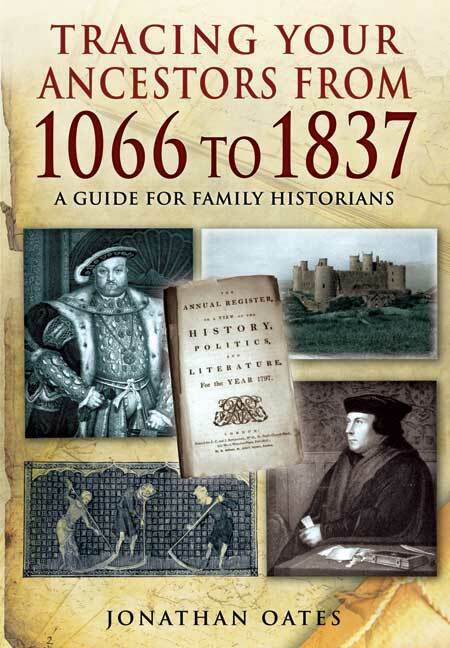 Easy to read and use comprehensive reference book of nearly 150 pages for family historians who have conquered the 20th and 19th centuries and want to go back further. The following eleven chapters cover many of the topics family historians would expect to examine once that had a need to use older and, in some cases, more difficult records, those written in Latin or with difficult handwriting, or uncatalogued or in out-of-the-way places. Dr Oates has collected many of these items into subject categories and indicates the usefulness and interest they might provide for researchers. The examples he uses to encourage new readers to explore further into the past than many might have thought possible. He includes some essential information about the whereabouts of important depositories mow which there are over a thousand spread over the country, and the final chapter gives information the record offices and libraries he has mentioned. Finally, there is some advice about reading old and difficult handwriting, a list of published official documents, and a useful index. This is an essential guide that gives the background knowledge needed to trace ancestors all the way back to the Middle Ages. The author describes how the administrative, religious and social structures in the medieval and early modern periods relate to the family historian and also includes a short guide to the best methods of reading medieval scripts. This is a clearly written book with individual chapters on specific categories of records. These include churches and parishes, courts, manorial/ property, taxes, early censuses and militia. There is a comprehensive guide to sources of information, their location and recommendations for places to visit. This handbook is an essential introduction for anyone who is keen to take their family history research back into the more distant past. Part of Pen & Sword’s reliable ‘guides for family historians’ series, this new title fills you in on how to trace your ancestors beyond the start of civil registration in 1837. Author Jonathan Oates describes the records of use to genealogists in the medieval and early modern period to guide you even further back into the past. This is a comprehensive and easily-digestible handbook that will undoubtedly open up fascinating new avenues of research in your family history quest. This is one of the best books that I have encountered in Pen and Sword's popular family history series, and one that promises to be an invaluable asset to anyone tracing ancestors before the onset of civil registration. The author achieves the delicate balance of including enough information about the institutions he discusses to give the reader a sound idea of their structure, without overwhelming his audience with facts. Each chapter is clear and empowering, providing solid suggestions about where to look for records, while also acknowledging that successful searching contains an element of luck. Ambitious in it's scope, and with a clarity of expression and ideas, this volume is a pleasure to read and one that you are likely to return to time and again as you delve deeper into your family's past. Tracing your ancestors through the major Victorian records can often be rewarding and even seem a doddle if your ancestors all lined up to be counted at the appropriate points of their lives. Here Jonathan Oates’ reveals the rich array of records that were left from Medieval to Georgian times, taking the approach of a professional historian in terms of setting the context in which those records were created. He begins by explaining that most records of this era were created by the church or the state (which were not always separate anyway), and the first chapter explains how those bodies impacted on the lives of individuals. The rest of the book looks at different categories of records in more detail. Parish records are covered, as well as those left by ecclesiastical courts, church licences, bishops’ registers, professional records and everything from apprenticeship to the early police. There are detailed explorations of both civil and criminal court records plus those from property, tax and others. Every family historian knows that getting back to 1837 is relatively easy, due to the introduction of civil registration in that year and of the census in 1841. But beyond 1837 is a different story. However, records are available, if you know they are and how to use them. Jonathan Oates’ new book introduces the researcher to tracing family trees back through the early modern period through the middle ages and, if you’re lucky, as far back as 1066 but guidance through administrative, legal and religious structures, church, parish, professional and court records, as well as documents pertaining to taxes, manors, property, militia and much more.